I’m back with a new list today! Living Books for Science! If you missed yesterday’s post it was on Living Books for History. Most of these will be for elementary/middle school ages BUT there are a few that my high schoolers enjoy as well. I’ll mark those with ***. Magic School Bus – Don’t forget episodes! You can find them on Netflix and YouTube! The science kits are wonderful. They can be found on Amazon. *** Horrible Science – They also have science kits but we haven’t tried them…YET!! Let’s Read and Find Out Science – Great for younger kids! See How They Grow – Another series that is really good for young kids. Discovery Kids – Another great series with a great magazine. *** The high schoolers really like the magazine! The Cat in the Hat Knows A Lot About That! – GREAT TV series on PBS to go along with the books! 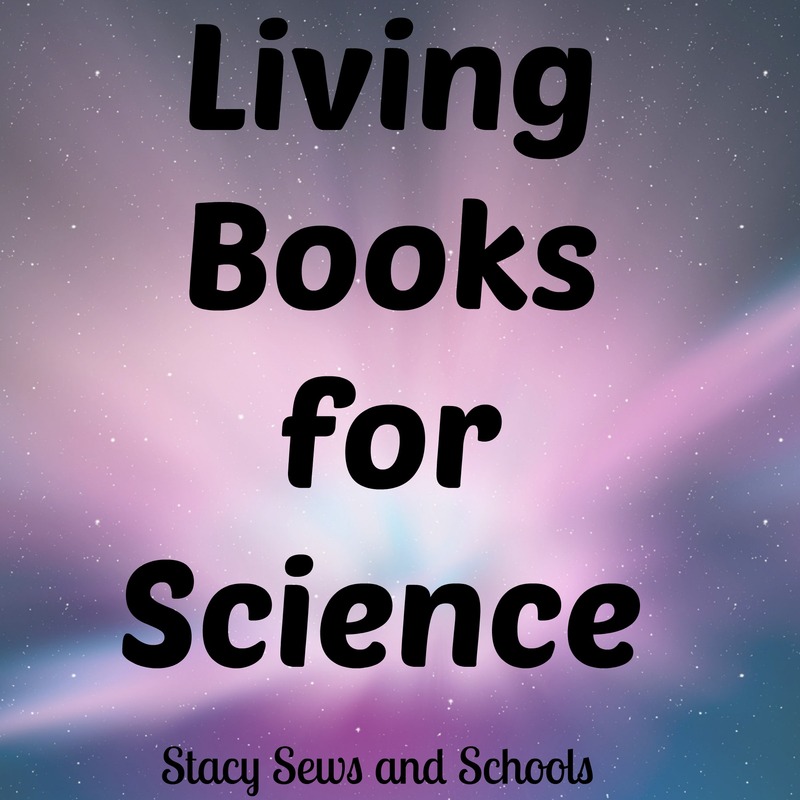 *** Janice VanCleave’s Science Books – Hands on!!! Some of them have even captured the attention of my high schoolers! The Magic Tree House – Most people think history when they think about this series BUT they have TONS for science as well. Currclick has a free book club for the series. *** Don’t Know Much About… – True, most of the books are history BUT there are a few that are on science topics. They have dinosaurs and the solar system to name two. My high schoolers like the adult versions of the books. Explore Your World – Hands on!! I forgot to add this to my history list!!! Usbourne – AWESOME science books! And another that I forgot to add to my history list!! ARGH! I need all my books unpacked!!! My First Discoveries – GREAT for younger kids. *** Idiot’s Guides – Same as above. 😉 The site has videos for different topics. Click on those and it shows a selection of books. There’s another science series that I have for my older kids but I can’t for the life of me remember what it’s called! And of course, they are still packed!! ARGH!!!! These are not books but are still GREAT- SmartLab Toys. Cailey and Colin love the Squishy Brain, Squishy Body and Squishy T-Rex. Wish I had remembered to add that to my dinosaur resources!! Good grief, if I only had a brain!!! Liam loves The Cat in the Hat Knows a lot About That! He even sings, “go, go, go adventure!” Haha! I cannot wait to check these out! Maybe I’ll learn something! Science is not one if my strengths. Lol! We try to keep science fun around here. We try to do A LOT of hands on, too. Sure am missing your sewing..know you are too.. Have you found a house yet? Know you hate to move again..eeek.. I wish we had snow here. All we’ve has is a dusting. WAH!!!!! Thank you. I DO miss sewing SOOOOO much!! Wish I could have sent the snow your way.. I don’t want it.. but the snow ice cream was really good..lol [My grandkids that live 3 hours from us, just hated that they didn’t get any snow… being the sweet Maw ,that I am, I took photos of the snow.. and of course the bowl of snow ice cream…].. You guessed it, They were calling me for sure.hahahaha. But, that was the most fun… teasing them..